I had some of these scarves made in 2013 and then someone else had some more made. The second batch of scarves are a bit different to the original 300 I had made. The original ones have ‘October 2013’ at one end; the new ones have ‘KEEP RIGHT ON’. What’s the point of the scarves? I had the first lot of scarves made because I wanted to provide a non violent way for fans to express their anger at the state our club is in. I don’t believe that anything we do here in Birmingham is going to have much of an effect on our owners in Hong Kong but it feels better to do something rather than nothing. Also, any sensible person who may be thinking about buying the club will take a look at our fans, because a good fan base is a very important asset. Anything that will help fans stay engaged will make the club a more attractive proposition for prospective buyers. I wanted a message that most fans could agree on, which is difficult as we do seem to be an anarchic bunch. 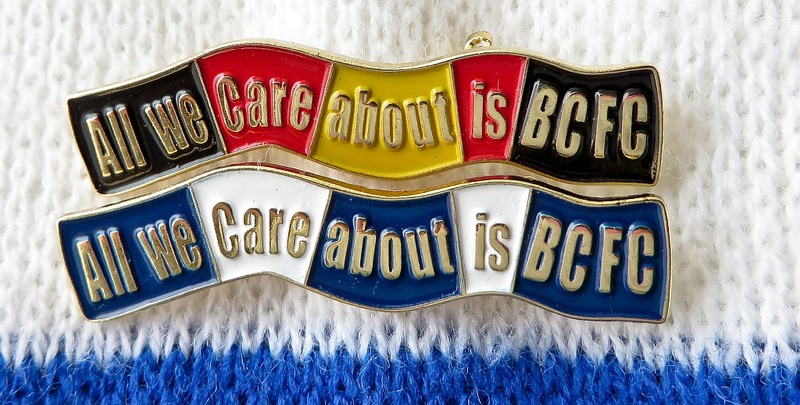 It wasn’t my idea to use “All we care about is BCFC”; it was a suggestion I read on a forum. I like it because it is a positive message but, because it’s a line from an anti-owner song, it implies dissatisfaction with the current ownership. The basic message I want the scarf to convey is an allegiance to the club and a concern about our present situation. Why yellow, red and black? If a protest scarf is to stand out it has to be in different colours to our usual royal blue. Someone suggested yellow, red and black because they were the colours of a 1970s away kit and they would stand out. There are now some AWCA badges. Fantastic idea re the AWCA scarfs. I was unsuccessful finding them outside the ground but look forward to getting two if and when some more are available? I think they have really struck a chord and are a great way to protest peacefully about the state of our beloved team. I’ll definately buy one at the next home game against Blackpool. I can use it to wrap round my eyes if the football’s anywhere near as bad as it was on Saturday, against Charlton!! Let’s face it.. It can’t get any worse…Can it? I’m a bluenose living in London and I really want to get my hands on one of these! The scarves are not available from me any longer but someone else is getting them made and also the badges. So they are on sale outside the ground from fanzine sellers. If you can’t get to home games yourself you need to try to find someone who can buy one for you.